Pu-erh is traditionally ‘rinsed’ before being steeped. This is done with a quick application of hot water that is poured over the tea in the gaiwan or teapot and then immediately discarded. The rinse water is not drunk – its purpose is to help the leaves begin to open during steeping. Use additional appropriately-heated water for the 1st steeping and subsequent re-steepings. 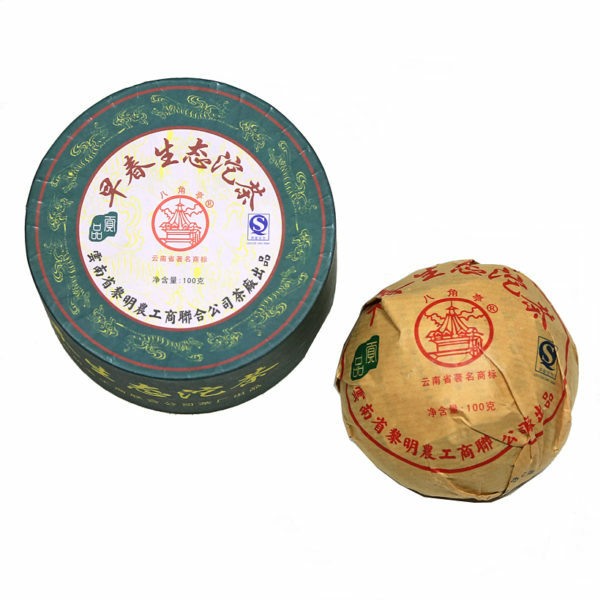 Unlike most other tea, Pu-erh is made from mao cha and not directly from fresh leaf. Mao cha is considered both finished tea and half-made tea. It is essentially young sheng Pu-erh and is drunk by villagers in Yunnan as well as being the leaf that all Pu-erh is made from. Mao cha is simple to manufacture but is complex in its diversity. It can be made from the fresh leaf of one tea garden or be a blend of leaf from an entire tea village or from several tea producing villages within one county. Mao cha can be stored and aged after it is made, or it can be a blend that is comprised of aged mao cha from different years. It is found in a variety of leaf sizes, too, depending on the location of the tea trees and on the type of local cultivars (size of the leaf) the mao cha was made from. Mao cha is a great example of the effects of terroir. As you can see, the possibilities and resulting flavors of mao cha are almost endless. All of these variables result in a staggering choice of mao cha for Pu-erh producers to work with. The Liming Tea Factory is highly regarded in China but is not very well-known in the West. Their yearly output of Pu-erh is small but it is always elegantly blended. Liming is also known for their sheng tai – tea made from raw materials that are organically or naturally grown. This tuo cha is made under the Liming Ba Jiao Ting trademark, which is named for the Ba Jiao Ting Buddhist Octagonal Pavilion, a valuable meeting place built in honor of Sakyamuni, the founder of Buddhism (hence the image on the box and wrapper). This tuo cha has the classic Liming raw Pu-erh style. It is a mix of young leaf and many buds, which give the tea lightness and spring sweetness that is most enjoyable. The aroma is slightly reminiscent of ripe red berries. Ready to drink now or good for setting aside to age.